About a month and a half ago I ordered a Wacom Intuos3 6 x 8-Inch Pen Tablet from Amazon for $199.99 (that penny counts!). After using it for barely two weeks the tablet started scrolling my windows up and down rapidly without any input. It would be sitting there, untouched and scrolling. I called Wacom, who confirmed this was a known flaw with the tablet and offered to repair it. Now, I'd just dropped $200 (screw the penny) on an item I plan to keep until its wires rust away into oblivion. I don't want it repaired two weeks into this lifelong commitment! I called Amazon, who said it was no longer in stock so they could only issue a refund not a replacement. Luckily in the interim I'd received a few rewards checks from my beloved Staples, which carries Wacom tablets. Unfortunately they only carry the latest ones so while my $200 bought a larger, older (albeit defective) model at Amazon, this time I could only justify the Wacom Intuos4 Small Pen Tablet. I was so impressed by the packaging I had to document it for all the internet to see (you're welcome). The tablet came in a suitcase (yes, it had a handle) type of packaging with sleeve. I immediately knew this would be worth documenting. Inside the sleeve was a generic box. See that mouse? I've had it for over five years. It has a back side button and is the most intuitive, comfortable, lifetime guaranteed product Microsoft has ever put out. If I didn't believe using a mouse would eventually lead to my developping carpal tunnel I would never let this one go. Its a much larger replacement (that's what she said) but so purty and my wrist loves it. Tablets can also be used with included mice - probably for when non-tablet users sit at our machines. I haven't tried out this mice at all. I took a picture and put it away. Pens are so intuitive that anyone but extremely young children without fine motor skills (or permission to use my machine) should be able to pick it up within a minute of starting use. The tablet came with two separate usb connectors - one for the right handed folk and one for the lefthanded. This is nice but I prefer the old fashioned, straight out of the center back style. I hate wires and clutter on my desk so aesthetically, this side-wired nonsense is a negative. Only designers buy tablets so aesthetics matter guys! I had the tablet wire running to the left of the sub for a week but it was annoying when repositioning the tablet to suit my constantly changing sitting style. This is what I settled on although I miss the top of the tablet option. Why disturb something that worked? As to the performance of the device - very nice. 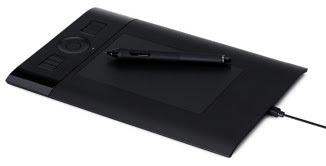 I've had experience with three different generations of Wacom tablets and this is definitely the most responsive. I could feel a difference even before opening Photoshop; just clicking around to install drivers and configure buttons was enough. You can also configure the buttons to work within a program. So within Photoshop I could have the top button select, second deselect, third save, fourth open, etc. I am a hotkey loving fool so I haven't configured it to this degree. The center circle is also a button configured in Photoshop to zoom in and out while in internet explorer I use it to scroll up and down a screen. It works just like an iPod's controls. The circle doesn't spin, merely reacts to the energy put out by your finger. The very center of the circle has a round button I don't use for anything. So there's my half-assed review which has people who like pretty things going "Oooooh and fellow graphic designers going "WTF!?" I'd recommend a tablet to anyone but definitely prefer the previous model's aesthetics. The all-black setup is swank but that side cable really, really bothers me and I dislike the perfectly vertical pen stand. I know I'll be breaking nibs soon. I've been thinking of getting the Wacom tablet for awhile, but was waiting for a personal review...I might have to get it now! Do I need it NO, do I want it YES!